Golden Apples: Whee for me! (well, almost done—there are few ends to weave in—but all the knitting is done!) 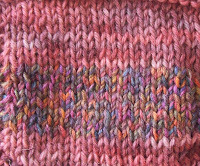 Just a pretty as I hoped for--Just enough color to make them interesting and just a little bulk (but also re-enforcement) at the toe. I can't wait to start my next pair! (spoken like a true addict!) --Peachy I think.. I have these 2 skiens of Koigu KPM in a semi solid (very near solid) peach—and the color is a very good match to my peachy sweater (from last winter). 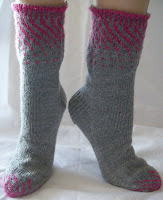 Socks to match, pretty simple ones, with the same lace stitch as in my peachy sweater. 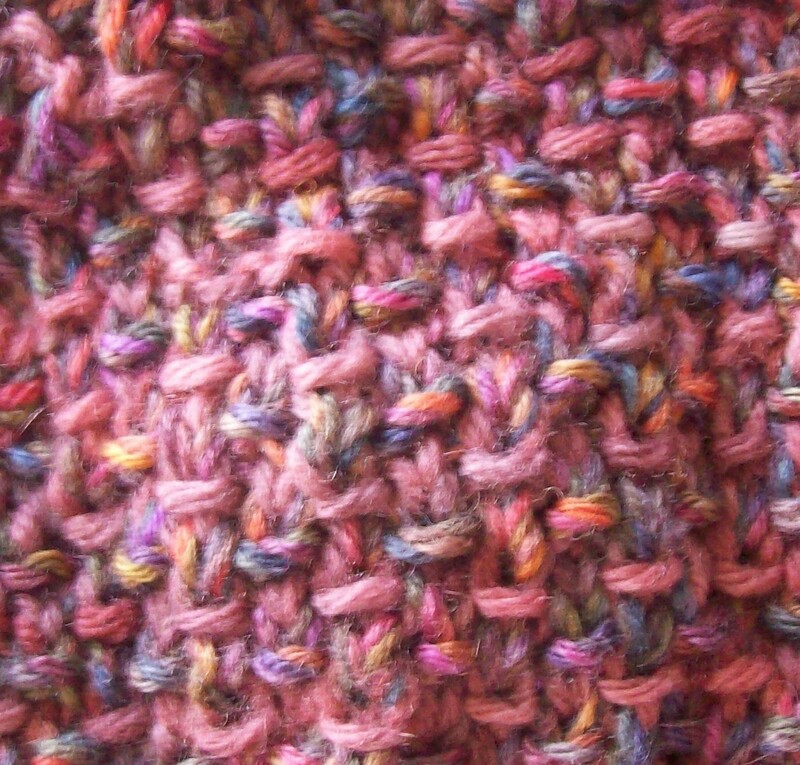 And some other stuff.. swatches: for gauge, for color, and for final effect --like this stitch-- (an original? Maybe, but not likely. More likely just uncommon) and hats. Oh! there are so many hats I want to knit! 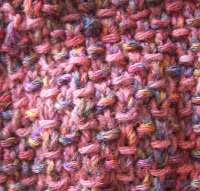 I want to swatch this stitch again--This time, the colors are pretty close--the semi solid is some home dyed (KoolAde) LB Fisherman's wool, the tweed is Classic Elites "Beatrice". I want to see how it looks when the colors are not so close in value. 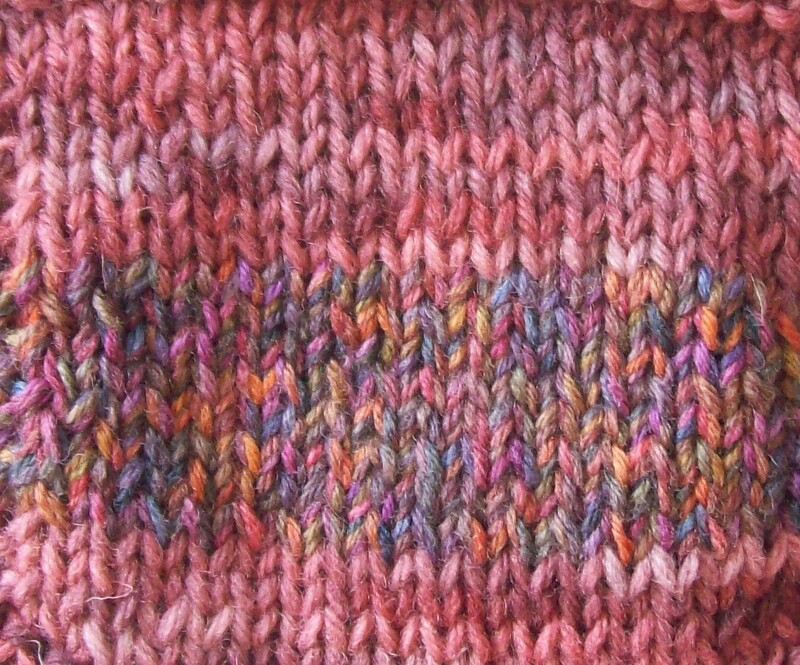 I don't think the stitch swatch looks striped at all-- (it is, in 2 rows of each yarn). Now to try another set of yarns, with a bit more contrast, and see how it looks. Right now, I really like it--but its totally un-replical. I need to learn how it looks with available yarns, and not home dyed semi solids. And maybe another pair (or two, or three, or..) of some fingerless gloves..some short ones, and some long ones, some matching hats, and some just to use up odd, incomplete balls of yarn—at least these (unlike most of my scarves and hats) will get worn. There a list of to do that should hold me for a while! I love the socks! They look great, and they look like they're comfy too. Those socks are gorgeous, but I really, really, really want to know more about that stitch pattern in the swatch photo on the right. I LOVE it! The socks are really lovely! I really like the pink and gray.